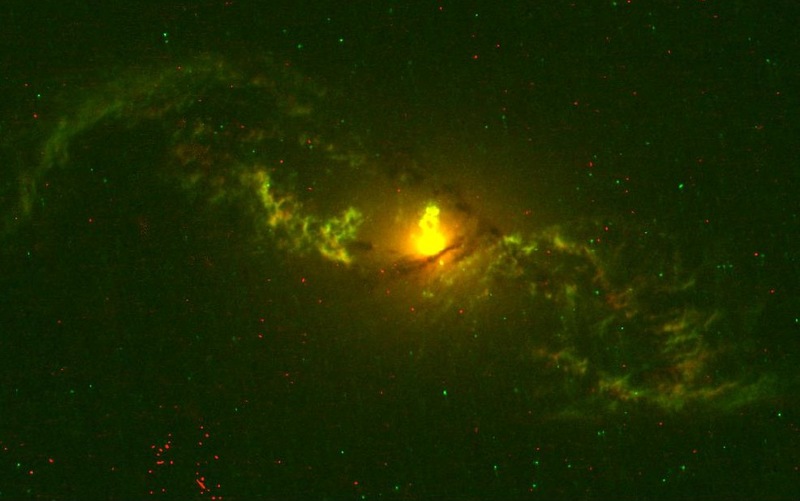 We just got the processed Hubble images for NGC 5972. This is a galaxy with active nucleus, large double radio source, and the most extensive ionized gas we turned up in the Voorwerpje project. We knew from ground-based data that the gas is so extensive that some would fall outside the Hubble field (especially in the [O III] emission lines – for technical reasons that filter has a smaller field of view). We expected from those data that it would be spectacular. Now we have it, and the Universe once again didn’t disappoint. 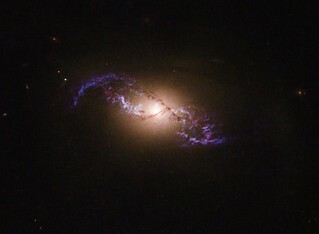 Another nucleus with a loop of ionized gas pushing outward (this time lined up with the giant radio source), twisted braids of gas like a 30,000-light-year double helix, and dramatically twisted filaments of dust suggesting that the galaxy still hasn’t settled down from a strong disturbance. Great find. When I found this article and saw the image of the galaxy I had to try processing the data myself.